How often do you eat Tuna per month? Well, let me introduce you to a seafood that has dramatically lower pollution levels in its flesh, and comes straight from our local waters: The humble blue crab. Not only is it far better for the environment than eating fish that are caught by boats that must motor hundreds of kilometers out to sea (tuna), you can walk down the street and lay traps for tonight’s dinner. So let’s get this pollution thing out of the way up front — one polluted fish is no better than another polluted fish, right? Local blue crab advisories suggest people eat no more than 6 crab per week, while tuna typically has a recommended maximum of about only a few servings per week. In both cases, they recommend women of childbearing age avoid eating them. So where am I going with this?!? Well, published pollution measurements (PCBs) show that the flesh of blue crab has far lower pollutant levels than the gut (0.03 ppm versus 6.55 ppm), and lower than any other seafood tested in the harbor’s waters (get book chapter here, Chapter 28, Table 28.1). The method used to determine maximum serving numbers uses the entire organism, so neglects the fact that the pollution in different parts of the fish can vary. So, eating blue crab from the region’s waterways is actually relatively safe, as long as you only eat the white flesh. The bottom line is that these are short-lived species and they do not bioaccumulate pollution in their flesh like large, long-lived fish do. A full bucket of blue crabs caught by an urban fisherman on a Hoboken pier at the edge of the Hudson River, September 27, 2012. He used six 10″ traps and spent five hours fishing. Granted, pollution isn’t just about bioaccumulation, PCBs or mercury, it can also be pathogens that immediately make you sick. To avoid this, one should make sure the crab flesh is adequately cleaned (perhaps boil, not steam?) and avoid fishing within 2-3 days after rain events, when combined sewage overflows occur in many of our waterways. None of this is terribly new … blue crab from our waters have been pawned off as Chesapeake blue crab due to their greater availability and size, as reported by the NY Times in 2006 (PDF: NYTimes 2006). And in many ways, it’s only been a question of where exactly you fish — many of the clams you purchase in the area are from the Hudson’s mouth, Raritan Bay, and are simply stored in clean waters for a few weeks before sale. Personally, I’m not eating East River blue crab every week. I bought a new trap and have tried a few times at Hell Gate, near my apartment (my large crabpot doesn’t fit so well in an apartment, so it’s at NY Harbor School helping educate kids on Governor’s Island). But I am learning more and cautiously optimistic that our continuing water quality improvements and recovery from past decades of heavy pollution will make it safe to eat blue crab more and more frequently into the future. This entry was posted in locavore, water, water pollution and tagged bioaccumulation, blue crab, dioxin, East River, health, Hudson River, intake, local, locavore, mercury, New York City, PCB, pollution, recommended, striped bass, tuna. Bookmark the permalink. Thanks for the interesting and informative blogs. “The New Jersey Department of Environmental Protection has found that blue claw crabs from the Newark Bay region are contaminated with harmful levels of dioxin and polychlorinated biphenyls (PCBs). Eating blue claw crabs from this region may cause cancer and harm brain development in unborn and young children. Fish consumption advisories in this region for blue claw crabs are DO NOT CATCH! AND DO NOT EAT! The Newark Bay region is composed of Newark Bay, the Hackensack, Passaic, Elizabeth and Rahway Rivers and the Arthur Kill and Kill Van Kull. Hopefully, there will be continued efforts for and investments in superfund cleanups, cleaning up the legacy of contaminated sediment in the Harbor, and preventing pollution to sustain healthy marine life! Thanks – great point – not all waterways are created equal, and not enough is understood about the pollution in crabs from one location to another. The most polluted sites around the Hudson and NY/NJ Harbor area are Newark Bay and it’s surroundings, Gowanus, and Newtown Creek, and it would be wise to avoid fishing in those places, legal or not. However, also note that the pollution study I cited above (Levinton/Waldman Ch. 28) was based on measurements from all those areas, so it supports the contention that the blue crabs do not incorporate the pollutants into their flesh, at least the PCBs that are in Table 28.1. I would love to learn more about pollutant sampling in area crabs, and learn if this is a general result. Great story about one of New York City’s best kept secrets. Just wanted to add that one of the things researchers from New York’s Department of Environmental Conservation had noted was the range of the Blue Crab. 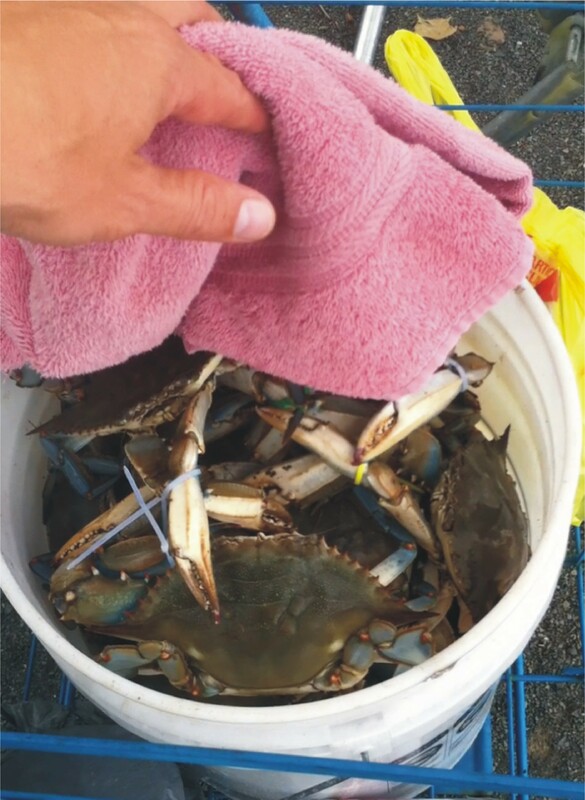 Annual releases of tagged crabs from Newburgh have been found as far north as Poughkeepsie and as far south as Raritan Bay, a distance of over a hundred miles. Thus, given the migratory leeway of the Blue Claws, to prohibit crabbing in Newark but allow for it within the Hudson is, IMHO, really false assurance. Despite that however, I too, am an urban crabber. I’d run out to Captree whenever I can, but sometimes that just ain’t possible. So even NYC waters will have to do when I get my crab jones. And yes, certain sections of the city does have dirtier (more sewage escape) water. Just one point about defeating possible pathogens; boiling water only heats to 212 F, whereas steam can go much higher. So if one is worried about bacteria, physically clean and rinse the crab as much as possible, then keep the crab exposed to steam (covered pot) for a good 20 minutes and it should kill anything that can cause disease transmission. Oh, and just wanted to mention too, that New York State has a minimum Blue Claw size requirement of 4.5 inch lateral point to lateral point (the widest measure of the top shell), max daily take of 50 or less, and no females with eggs (orange sponge on underside) or else one can be fined if a NYS DEC enforcement officer catches a violator (surprisingly, they do check). Finally, one does NOT need a license or permit to recreationally crab in New York State. However, if one fishes with rod and reel, then a free Marine registration is needed. Great info!! Thanks and glad to see this post is still “in play” – it’s one of my personal favorites, but got buried under all the “storm surge flooding” posts since Sandy. .